We study two essential biological “nanomachines” of gene expression, the spliceosome and RNA polymerase II (Pol II), using brewer’s yeast as a model system. Our studies on the spliceosome focus on U6 RNA and the dynamic RNA-RNA and RNA-protein interactions required for its assembly into the active site. Using genetic suppression analysis and in vitro biochemistry, we have defined a complex network of interactions that involves 3 RNAs (U2, U4, and U6), two helicases (Prp28 and Brr2), an RNA-binding protein (Prp24), and the largest and most conserved spliceosomal protein (Prp8). In collaboration with Sam Butcher’s lab, we recently solved the crystal structure of the core U6 snRNP (Prp24 bound to U6 RNA) at 1.7 Å resolution (see Figure 1). Figure 1. From EJ Montemayor et al. (2014) Nature Struct. Molec. Biol. 21: 544-551. Our work on Pol II focuses on transcription termination as a strategy for gene regulation. 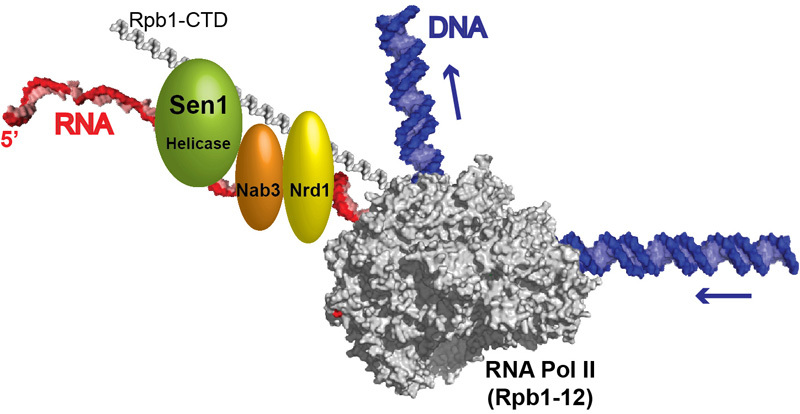 We discovered and are characterizing a pathway that uses the helicase Sen1 and a collection of RNA-binding proteins, including Nrd1 and Nab3, to terminate synthesis of short transcripts by Pol II (see Figure 2). This pathway aids in the synthesis of non-coding RNAs, as well as the regulation of mRNA levels. Mutations in the human homolog of Sen1 result in neuro-degenerative disorders. We are exploring the function and targets of the Sen1 termination pathway by genetics, genomics, biochemistry, and structural biology. Figure 2. From DA Brow (2011) Molec. Cell 42: 717-718. Perform a customized PubMed literature search for Dr. Brow. • Chen, X, Poorey, K, Wells, MN, Müller, U, Bekiranov, S, Auble, DT, Brow, DA. (2017) Transcriptomes of six mutants in the Sen1 pathway reveal combinatorial control of transcription termination across the Saccharomyces cerevisiae genome. PLOS Genetics, 13:e1006863. • Montemayor, EJ, Didychuk, AL, Liao, H, Hu, P, Brow, DA, Butcher, SE (2017) Structure and conformational plasticity of the U6 small nuclear ribonucleoprotein core. Acta Cryst. D Struct. Biol., 73, 1-8. • Rodgers, ML, Didychuk, AL, Butcher, SE, Brow, DA, Hoskins, AA (2016) A multi-step model for facilitated unwinding of the yeast U4/U6 RNA duplex. Nucl. Acids Res., 44, 10912-10928. • AL Didychuk, EJ Montemayor, DA Brow, SE Butcher. (2016) Structural requirements for protein-catalyzed annealing of U4 and U6 RNAs during di-snRNP assembly. Nucl. Acids Res. 44, 1398-1410. • Montemayor, E.J., Curran, E.C., Liao, H.H., Andrews, K.L., Treba, C.N., Butcher†, S.E. , and Brow†, D.A. (2014). Core structure of the U6 snRNP at 1.7 Å resolution. Nature Struct. Molec. Biol. 21(6):544-51 (PMC4141773) †corresponding authors. • Price, A.M., Görnemann, J., Guthrie, C., and Brow, D.A. (2014). An unanticipated early function of DEAD-box ATPase Prp28 during commitment to splicing is modulated by U5 snRNP protein Prp8. RNA 20, 46-60. • Brow, D.A. (2011). Sen-sing RNA terminators. Molec. Cell 42, 717-718. • Brow, D.A. (2009). Eye on RNA unwinding. Nature Struct. Mol. Biol. 16, 7-8. • McManus, C.J., M.L. Schwartz, S.E. Butcher, and D.A. Brow. (2007). A dynamic bulge in the U6 RNA internal stem-loop functions in spliceosome assembly and activation. RNA 13, 2252-2265. • Bae, E., N.J. Reiter, C.A. Bingman, S.S. Kwan, D. Lee, G.N. Phillips Jr., S.E. Butcher, and D.A. Brow. (2007). Structure and interactions of the first three RNA recognition motifs of splicing factor Prp24. J. Mol. Biol., 367, 1447-1458.